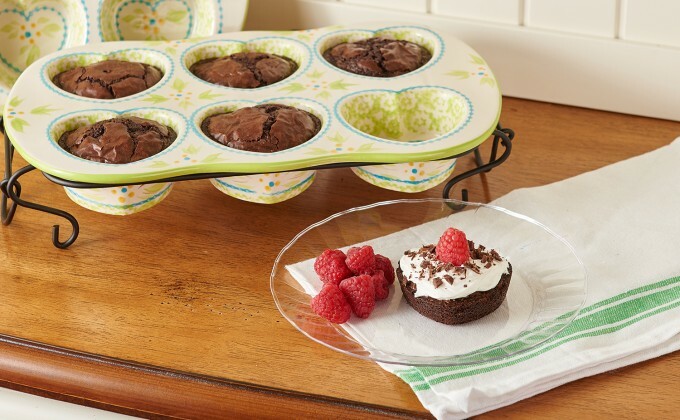 Lightly spray two temp-tations® heart-shaped muffin pans with non-stick spray. Add in chocolate syrup, sugar, eggs and vanilla. Whisk until smooth. Fold in flour and baking powder. Make sure batter has no lumps. Fold in chocolate chips. Fill each muffin cup half full with batter. Bake for 25 minutes or until centers are set. Cool completely. Spread some vanilla frosting on the top of each brownie. Top with a few raspberries. Use a sharp knife to shave the block of chocolate. Arrange some chocolate shavings on top of each brownie.